New 10.1″ high-definition video on JetBlue Airbus A320. Photo credit: JetBlue. Last month Alaska Airlines (ALK) announced a totally refreshed cabin on its Airbus A321 aircraft, featuring such goodies as comfy leather sets from Recaro and high-bandwidth WiFi. Now JetBlue (JBLU) is joining the party, launching an impressive new cabin on its Airbus A320 aircraft. The upgrades to the cabin include what JetBlue says are the widest seats available for the A320, along with custom-designed seatback inflight entertainment with 100+ channels of DIRECTV and hundreds of free movies and shows. 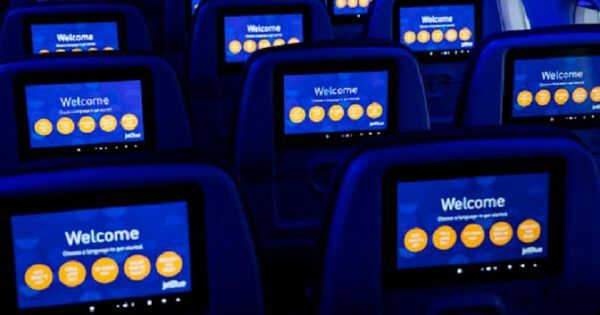 And unlike many other airlines, JetBlue is actually putting video screens on the seatback. The new cabin includes 10.1 inch, 1080P high definition screens at every seat, and you can pair your mobile device to the screen for use as a TV remote or a gaming controller. In the cabin, high-definition television meets high speed Internet. JetBlue says the upgraded interior includes gate-to-gate Fly-Fi high-speed Internet. Passengers will get to enjoy this connectivity in both US and in Caribbean and Latin American service, where Fly-Fi had not been available until now. Somewhat confusingly, the new cabin is Phase 2 of JetBlue’s upgrade plan. Phase 1 has been going on since 2018, with more than a dozen A320 aircraft already completed. The Phase 1 A320 update includes Rockwell Collins Pinnacle seats and LiveTV 4 entertainment options, both currently in place in JetBlue’s A321 aircraft. The Rockwell Collins Meridian seats to be installed in the Phase 2 upgrades are more than 18” wide, have enhanced cushions, contoured seatbacks and adjustable headrests, as well as at least two easily-accessible power connections at every seat.About a third of JetBlue’s A320 aircraft are scheduled for cabin restyling by the end of the year. “JetBlue rocked the airline industry in 2000 with seatback television and all leather seats. In our first makeover since, this incredible new onboard experience represents what the founders would have done if they were launching JetBlue today,” said Marty St. George, executive vice president and chief commercial officer of JetBlue. The new cabin and seating may provide JetBlue with a long-term advantage in satisfying customers. The airline also has a short-term advantage: it flies none of the grounded 737 MAX aircraft. Competitor American Airlines, for example, says the impact of the 737 MAX grounding has resulted in it cancelling 90 flights a day. JetBlue instead operates a fleet of 193 Airbus aircraft (A320 and A321) along with 60 Embraer 190 regional jets. The new seats in JetBlue’s refreshed Airbus A320 cabin still offer 32″ of leg room. Photo credit: JetBlue. Passengers will particularly enjoy that they’re getting the new cabin without losing legroom. The new cabins, like the old, maintains Jetblue’s position as the “comfort leader” in economy class, which JetBlue calls “core” (and the rest of the industry calls coach). The new Collins Meridean seats will come with 32” of legroom (seat pitch). The new A320 cabin will include 162 seats, including 120 “Core” economy seats and 42 Even More Space seats (JetBlue won’t call them Premium Economy) with 35” of seat pitch and no doubt a higher ticket price. Jet Blue’s popular Mint business class seating will not be offered on the A320, but only on A321 airecraft. The first few completed planes will be deployed to Boston, which JetBlue calls a focus city, and where it is the largest carrier. The planes will fly on a variety of domestic and international routes. The new cabins will certainly make JetBlue more attractive to flyers searching for a comfortable and entertaining solution in coach class. But JetBlue, which flies 42 million people a year to over 100 destinations, is nonetheless the sixth-largest carrier in the US. With a market share of 5.6%, JetBlue trails American, Southwest, Delta, United and Alaska. In 2019, JetBlue’s load factor has dropped from 82% to 80%, while the stock is trading near its 52-week low. Nonetheless, the highly competitive new cabins will serve Jet Blue well if its rumored expansion to European service takes place this summer. And if things go in a different direction, there are rumors that another airline (named after the 50th US state) with few competing routes and a fleet of updated Airbus aircraft might make a good match. The interior of the refreshed Airbus A320 from JetBlue. Photocredit: JetBlue. 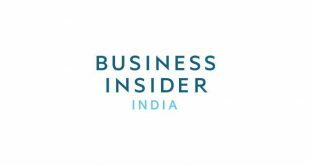 Next Is Robinhood Regulated and Safe?